Many of you have been asking us to review the Nikon D3400 against the new D3500 since a while. And if you already have bought the older generation cameras like the D3100, 3300 or the 3400, then this is a question that must be on top of your head. But you aren’t alone, there are many like you and this article is focused specially on people like you. If you aren’t much of a reader and would like to see a video instead then you can log onto our YouTube Channel and see a complete comparison. 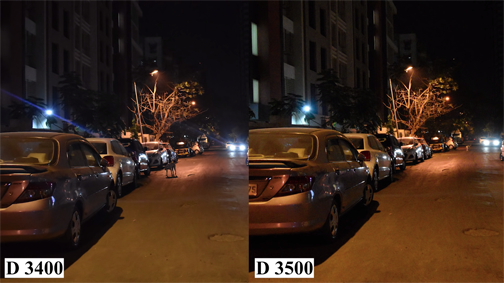 So while there is much to deliberate when it comes to the new D3500. It has literally taken Nikon two whole years to launch the new update. And that is fair since the new product cycle in the photography industry is approximately that. But what is important to note is that there are many similarities between the two cameras. Same size sensor: Both the cameras feature the same size sensor, which is 24.2 megapixel and are powered by the Expeed 4 processor. Unfortunately the new D3500 still doesn’t support in-body image stabilization. 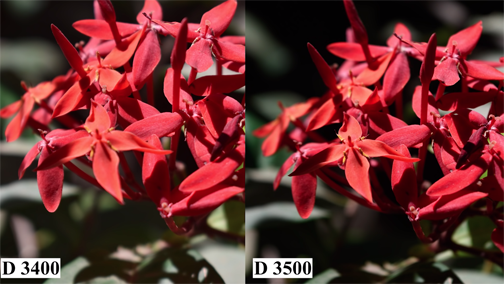 But while the specs of the sensors are the same, according to Nikon the sensor on the D3500 has been tweaked slightly as compared to the 3400 in order to give better performance. So whether this has an effect on its performance and the output is something that we will check later. ISO capability and FPS: They both have an ISO range of 100-25,600 and shoot at 5 fps. They also feature the same 11-point focus system that has been around in the D3400 since years. At the back it has the 3-inch LCD screen with features 921k resolution. So largely the D3500 features the specs as the D3400. 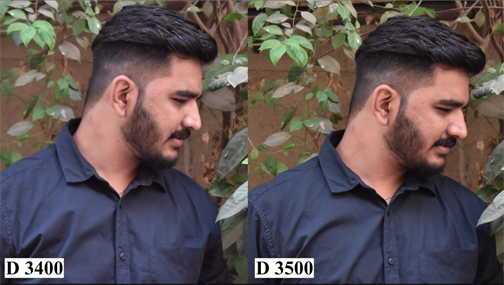 The D3500 comes at Rs. 34,500 approximately with the 18-55mm lens. On the other hand the D3400 has been discontinued by Nikon and might be difficult to find in the Nikon authorised stores. But on aggregator platforms like Amazon and Flipkart one can easily find a deal for the camera at approximately Rs. 30,000 (which might include a dual lens kit). The first thing you notice is that the D3500 it is lighter a slightly compact than the D3400 (it is 30 grams lighter than the 3400). Next, all the buttons have moved to the right making it easy to operate. And since these buttons have moved to the right and the body is more compact, the screen seems a lot bigger. The camera also features a deeper grip as compared to the D3400. But this deeper grip also means that your fingers might get stuck in the 3500, especially for someone which has bigger hands. The plus point however is that it offers a much more handy grip even when you attach and use more heavier lenses. One of the key improvements in the 3500 is the increased battery life. The battery life has been improved by over 30% in the 3500 as compared to the 3400. As per the CIPA ratings a single charge can now give 1550 shots as opposed to the 1200 pics that the 3400 could give using the same battery. But where they have improved all of these things I felt that they should’ve also worked on some of the things to improve from the D3400. No external microphone input: The camera still doesn’t come with an external microphone input. Now this was not there in the D3400 also, but in today’s day and age with users migrating towards using the cameras as video recording devices, I think this is a must have. Less customisable buttons: The D3500 unfortunately has less customisable buttons as compared to the D3400. In the previous camera, there was a Fn button on the front-left side of the body. But this has been removed in the D3500 in order to give the front a cleaner look. While that might be great, a quick customisable button usually proves very useful for consumers who want to toggle and change settings quickly. No swivel screen: And as the other cameras in this category, the 3500 doesn’t have a swivel screen. Now this is something that you can still live with. But not have a touch screen at the back is not great. With more and more users looking to upgrade from their smart devices to the entry-level segment, a touch screen is an important feature to have. With both the cameras featuring the similar specs one might think that the performance of the cameras might be the same. But there certain changes in the performance that are noticeable. In terms of the performance of the cameras in daylight conditions, there’s hardly any difference in the pictures between the 2 cameras. The image of the flower that we have shot here is well saturated, sharp and also reproduces the colours accurately. 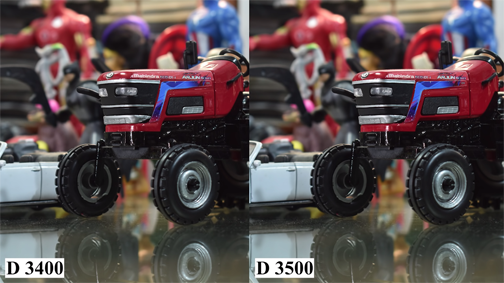 Although the image from the D3500 seems slightly brighter and better exposed. But the difference between the two cameras is marginal. As for the picture of the props and toys, the colour is also poppy, well-rounded and overall nearly similar. But in this case as well the sharpness and details in the D3500 is slightly higher than the D3400. It is nearly the same with the portraits as well during the day. All the images shot with both the cameras are shot on the exact same settings. And again the pictures are good. But the overall images in the 3500 seemed slightly more saturated as compared to the 3400. The image also has a slightly warmer cast than the 3400. In terms of the low-light images, whether portrait or otherwise we can see slight changes in the images. For instance the biggest one is the use of the older lens on the 3400, you can see a lot of lens flaring in the images from the 3400 as compared to the images from the 3500. But as for the images again there wasn’t much to choose from. The images are nearly identical and one can hardly tell the difference. The video performance for the cameras was what differentiated things for me. While both cameras seemed to have a slight focus tracking problem, the 3500 was a lot better than the 3400. And while you don’t have a swivel screen making it easy for your to use it as a vlogging camera, there is enough there to make the cut in this department. So what is the overall answer then? 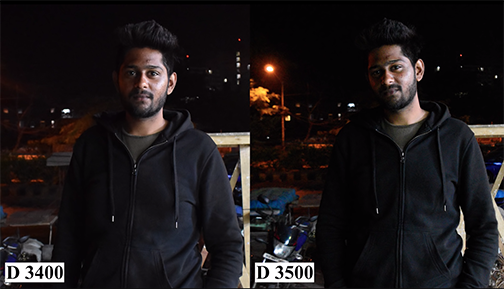 Should you go for the D3500 if you are a new user or if you have an older camera like the D3100, 3300 or 3400? Well this is a mixed bag for me honestly. If you are in the market to buy a new camera then yes surely you should buy the D3500. But if you are using an older camera like the 3300 or the 3100 then there are a lot of formidable upgrades that make the D3500 interesting enough for you. And if you already using the D3400 and are thinking of upgrading then this is a question best answered by you. If you see the specs then the specs are same, but there are small tweaks that have made the performance of the D3500 slightly better. So if you have the extra money and can afford that upgrade then you could go with the D3500. But for the new users I would also suggest that you look at some of the other mirrorless options in the market around the same price range since that is where the future is heading according to us.